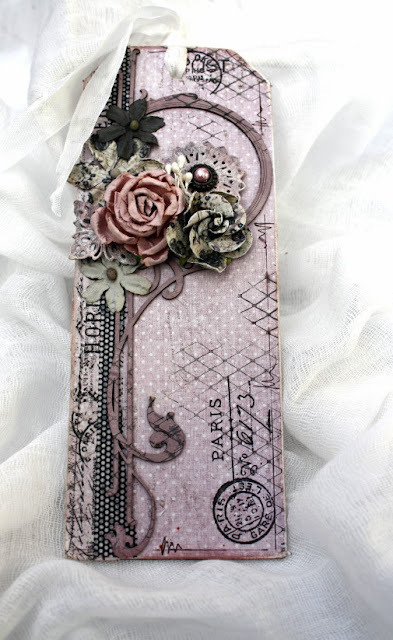 I combined 3 different chipboard designs with various blooms. the Angies-vine is trimmed into smaller sections and scattered amongst the roses . I used the top section of the ferns because I only required smaller leaves . The sections of the Angie Vine are firstly inked with White /Versa color ink. I added small dabs of slate to some of the pieces to create variation. PAPERS : 7Dots Studio , Prima, Dark Grey cardstock. and dabbed some Rose /Versa Color ink on the cherries. and for the final touch, stamp with a text stamp to add dimension . I added a cluster of blooms, altered filigree, and a pearl vintage brad . finished off with a strip of washi tape /Tim Holtz , and a background stamp . These are stunning Heather!! LOVING the colors and the flowers!! And that first photo is just precious!!! Wow, you do romantic so well! These lay-outs and tag are absolutely gorgeous! Your prejects are absolutely awasome! 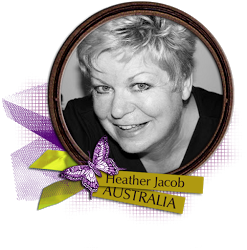 Heather you always inspire me, I just which I could get things to go together as well as you do. The photos you've used in these projects are beautiful as your cluster designs. Just love these!! That first photo is divine! Just love your work! Totally gob smacked as always..love the patchwork bg on the middle one & the Paris tag.....well, I'll let you know when my birthday is, put it that way!!!!!!!!!!! Simply outstanding, especially the first page - totally stole my heart! Stunning Heather, both of them and those photos are amazing!! Wow! What GORGEOUS creations Heather!!!!!!!!!!!! Simply stunning!!!!!!!!!! Amazing!!! What else can I say. Your projects are like looking at works of art. Your details and designs are simply gorgeous! Such beautiful artworks Heather! Simply inspirational!! WOW that top layout is STUNNING!!!!!!!!!!!!!!!!!!!!!!!!! I love how you aren't afraid to cover the photo just a little. Awesome Heather, how wonderful you work with colour .... and the way you do your stitches .... stitching, always amazes me.